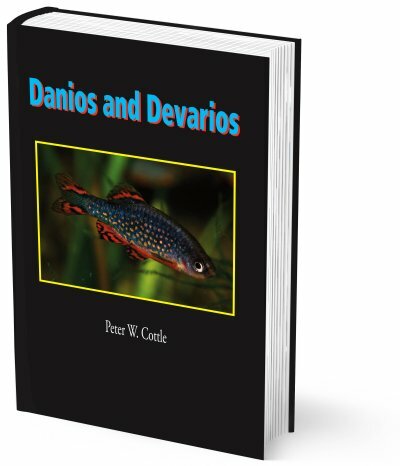 Each species of Danio, Danionella, Devario, Microdevario, Microrasbora, Esomus, Chela and Paedocypris has at least one page of text and picture where available. Species that have yet to be described have also been included. In addition, a number of blank pages have been included so that as new species become available, the information can be down loaded from the web site and placed in the book. This should ensure that the book is always up to date. Wherever possible, I try to add updates as soon as the information is to hand. A delay may be experienced due to the need to obtain if possible the authority to use copyright pictures. The book also contains a superb article by Ivor Hilton on breeding Danionella translucida (with additional information by Pete Liptrot & Paul Dixon of Bolton Aquarium). Dr Ralf Britz has contributed a great article on the Scientific study of Danionins and Dr Sven Kullander has written a very thought provoking foreword which he has entitled 'Passion'. Reviews of the book have been very encouraging. One reviewer stated that it would be the standard text book for the Danionins for the next 20 to 30 years. Another liked the idea that it could be kept up to date by down loading from the web site the latest information. Since publication, the book has been purchased in many countries. In order they are: Australia, Austria, Belgium, Brazil, Canada, China, Czech Republic, Denmark, Finland, France, Germany, Holland, Hungary, India, Italy, Japan, Malta, Myanmar, New Zealand, Singapore, Sweden, Switzerland, Taiwan, Thailand. United States of America and of course the United Kingdom. I would be very happy to add your country to the list! Steven Simpson Books are the place to contact for books on fish. Their list of freshwater fishes numbers around 400. Browsing amongst the catalogue, you cannot fail to be impressed.